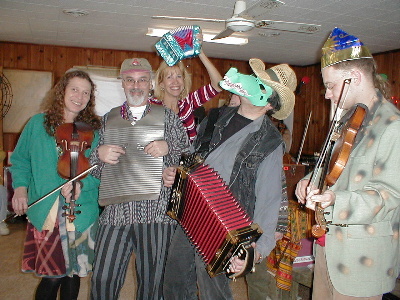 February 15, 2002 A sense of post-Mardi Gras energy and renewal has helped launch the crew into a pre-spring burst of productivity. 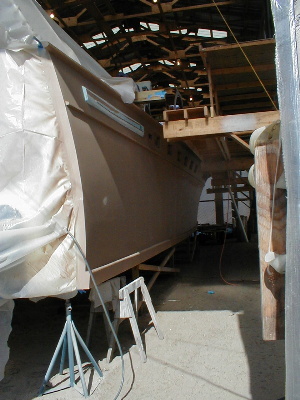 Cherokee’s hull was painted with four coats of primer and four coats of sprayable faring compound this week, giving her a dignified sand-pebble exterior. 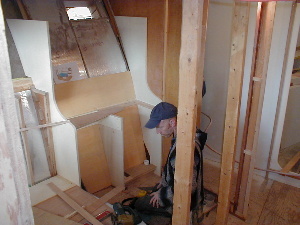 Stuart, Bud, Leonard, Norm, Jim, and Bill Davis carried out this task in one day. 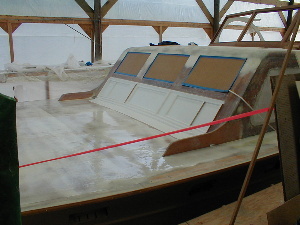 Below is the morning after, a primed hull ready for board sanding. This process will take about two weeks. 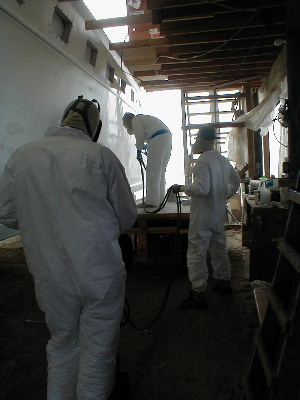 The entire evolution will happen two to three times before the hull is ready to start with the final primers and top coat. Jeanette, Jim, and Leonard fit the toe rail to the deck, and drilled all the holes for the fastenings. 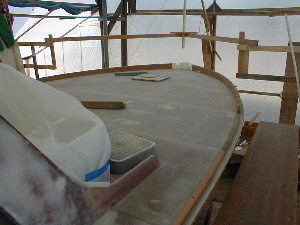 Once fitted, the toe rails were removed and Leonard spread a coat of microballoons on the deck to fill the weave of the fiberglass cloth. 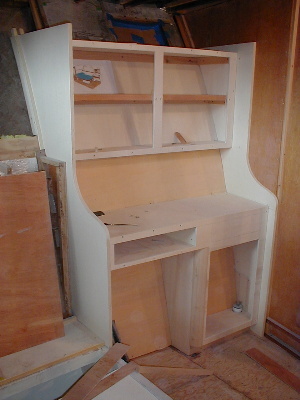 All this will be sanded smooth and the toe rails will be re-installed and glued in place. The next step for the deck will be painting. Below is more decking cured and ready for sanding. 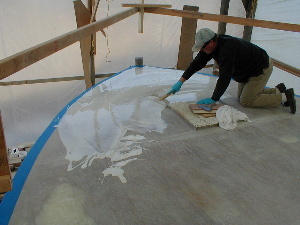 All portions of the decking which will be painted instead of teaked have undergone this epoxy/microballoon application process. 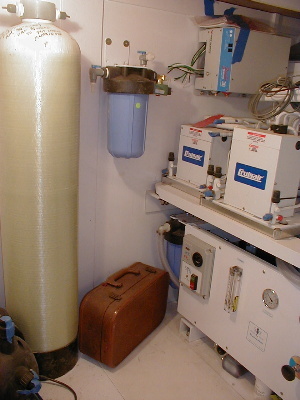 Tom Parker (“Floor Tom”) has been busy below, working on the dayhead vanity and the forward stateroom vanity, or what he affectionately calls “the angular nightmare.” Tom Kirmeyer (“Rack Tom”) has worked close by in the equipment room, installing the water maker and air conditioner compressors. 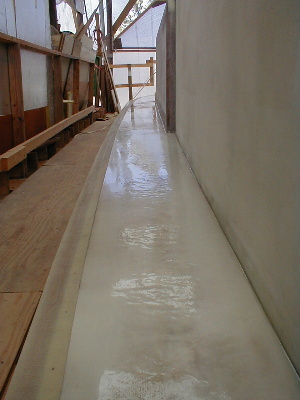 The racks are built in place, and the equipment is fastened down.